This is sponsored content and was provided by Susan G. Komen San Diego. 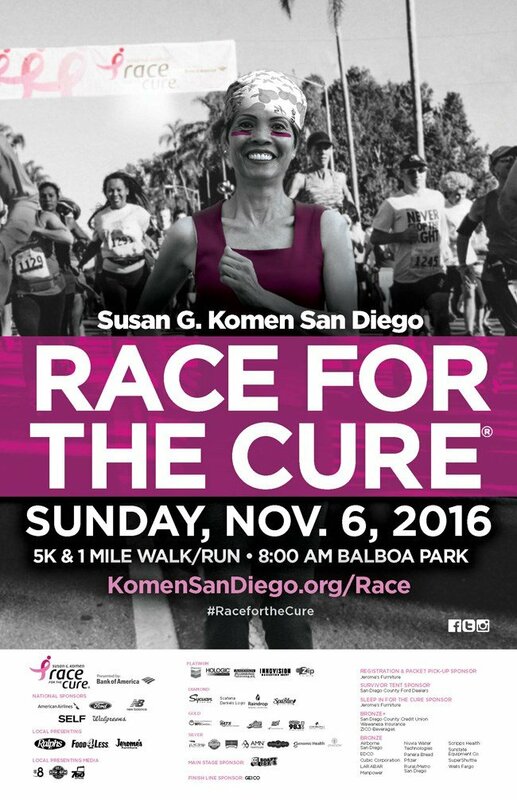 SAN DIEGO (Sept. 6, 2016) – Susan G. Komen San Diego (Komen San Diego) announced Hannah Martine of North Park as the 2016 Race for the Cure Honorary Survivor. Hannah will be this year’s spokesperson through the 20th annual Race for the Cure on Sunday, Nov. 6. At just 29-years-old, Hannah was diagnosed with Stage IV breast cancer (metastatic breast cancer). She was scared and had a lot of questions. As soon as she was diagnosed, she sought out Komen San Diego to receive resources as well as a lot of emotional support early on in her journey. The organization provided her with financial aid through her treatment, which helped her immensely as a young, single professional living on a budget living far away from her family. Metastatic breast cancer is breast cancer that has spread beyond the breast to other organs in the body (most often the bones, lungs, liver or brain). Although metastatic breast cancer cannot be cured, it does not mean it cannot be treated. Nearly half of Susan G. Komen’s funding for 2015 was invested in metastatic research bringing metastatic research to $147 million in 377 grants since the founding of the organization; the most of any organization outside of the U.S. government. Hannah is thankful for the support of her family, friends and Komen San Diego through her ongoing breast cancer fight. After a yearlong battle, Hannah’s cancer is in remission, but she isn’t cancer free. As Komen San Diego’s 2016 Honorary Survivor, she will use her personal journey to talk about breast cancer misconceptions and the importance of research. She also wants to educate the local community about the importance of being proactive with your health, especially young women who might not think they are at risk of getting breast cancer. “Some of you know, some of you don’t yet, so here it goes. A few weeks ago I was diagnosed with breast cancer. It’s surreal, it’s scary, it’s a lot of things. At 29, with no family history of cancer, I never thought “oncologist” would be in my daily vocabulary. But it is. There’s a lot of uncharted water ahead,” wrote Hannah on her Facebook page on Aug. 21, 2015. A lump does not have to feel like a lump. 29 is not too young to have breast cancer. You do not need to have family history of breast cancer to get it. Stage IV breast cancer is not a death sentence. Hannah’s Mom and Dad have traveled from Wisconsin to be there for her chemo treatments but are unable to be with her 100 percent of the time. Hannah has been pretty much on her own, without any family close by, to go through her breast cancer journey. To hear that her daughter had breast cancer was devastating for Sally, Hannah’s mom. Even with her family so far away, Hannah found herself surrounded with a tight-knit support system, helping her through the good days and the bad. Her friends have been there every step of the way, coming over for movie nights, driving her to doctor’s appointments and cooking meals. Her team at Oster & Associates have let Hannah work half days to recover from the exhausting rounds of chemo and showed up at last year’s Race for the Cure to be her personal cheering squad. Hannah celebrated her 30th birthday on June 17 of this year, a poignant milestone for anyone, but even more special as she finished her final round of radiation just six days after. How did she mark the occasion? By doing something special, something she has always wanted to do, a picnic by the ocean. At the party, she and a close group of friends along with her Mom and sister toasted to a stunning San Diego sunset, celebrating Hannah, her strength, courage, determination and love of life. Diagnostic mammograms, biopsies, MRI’s, ultrasounds and more for qualified women who have nowhere to turn when breast cancer strikes. Temporary financial aid – including rent, mortgage, prescription drug payments and more. Meal delivery for a woman and her entire family. Intensive patient navigation – complete with emotional support for all. The world’s largest investment of breast cancer research – next to the U.S. government. Since 1982, Susan G. Komen has invested more than $889 million in over 2,400 grants for breast cancer research. Currently in San Diego there is more than $2 million in five active grants at work to find the cure! Wherever there’s a gap – Komen San Diego fills it. The Komen Race for the Cure is a unique 5K and 1 mile race designed and implemented to promote positive awareness, education and early detection of breast cancer. It has proved to be an enormously effective way to reach many women and men with the message that breast cancer does not have to be fatal if regular mammograms and breast self-exams become routine. As well as being a road race for runners, the Komen Race for the Cure is an emotionally charged event attracting many first timers and recreational runners. It is an opportunity for thousands of women, men and their families, running or walking, to share a message of hope and inspiration with their communities. Register at komensandiego.org/race. Since its inception in 1995, Komen San Diego has raised more than $14 million to fund local non-profits who provide everything from free diagnostic mammograms, meal delivery, temporary financial aid, transportation and more. Seventy-five percent of every dollar raised in San Diego stays in San Diego County to fund breast health services for uninsured and underinsured women and their families. The remaining 25 percent funds international breast cancer research. In fact, next to the U.S. government, Susan G. Komen® is the largest funder of breast cancer research in the world. For more information, please visit www.komensandiego.org. Connect with us on Facebook and Twitter and Instagram.